Take a look at some of the awesome reviews our Hocking Hills cabin rental is getting from around the world. If you need a rental in Hocking Hills this is the best place to stay and its in like new condition. Rent our Hocking Hills Cabin today!! 10/26/18 Eagle View Escape – This place is so beautiful! I loved the view of the rocks and the way the rooms were decorated was phenomenal. Thank You! 9/14/18 Eagle View Lake House – Thank you for a lovely stay. Gorgeous views and every comfortable. 8/16/18 Eagle View Retreat – Thank you for sharing your cabin with us! We had a great time here. Hope to be back soon!! Bridget, Kyle, Amber, Ray, Aleen and Preston. 8/14/18 Eagle View Escape – Thank you so much for the cabin. We had a great time. The cabin is very comfortable and the décor is beautiful. Great location, peaceful and quiet just what we needed. Mary, Denise, Judy, Carla and Marilyn. 7/29/18 Eagle View Lake House – Thanks for a great house! Had a great time with my Dad and 2 sons. 7/22/18 Eagle View Retreat – We had a great weekend! Thanks for such a comfy place to stay! The Layman & Bass families. 6/4/18 Eagle View Retreat – I was very pleased with my stay and wouldn’t change a thing. The beds are so comfortable. Amy & Ryan. 5/25/18 Eagle View Lake House – We truly enjoyed every minute of our stay at Eagle View! The house is beautifully decorated and functional; the deck and views are spectacular. For the nature lover or fishman, this property is truly heavenly! Than you so much for your wonderful hospitality. The Donatella family. 3/4/18 Eagle View Lake House We all had a fantastic time here! Beautiful cabin. Thanks, The Mitchell cousins. 3/2/18 Eagle View Retreat Great hiking, excellent hot tub and fantastic cabin! This place is awesome! 3/2/18 Eagle View Escape The house is lovely and we had a blast. Thanks!!! 2/15/18 Eagle View Lake House Thank you so much for giving us a winter escape. We enjoy your cabin so much. Everything is always so perfect, it’s hard to find a home with all the comforts of our own home, we both enjoyed our stay. Thanks Dave & Joyce. 1/28/18 Eagle View Escape Great winter getaway! Thanks for an amazing place. Kari & adventure group. 1/21/18 Eagle View Escape We came here for a girl’s trip and the winter hike. A great time was had by all! We were a group of 9 and were very pleased and comfortable in the space you have to offer. Would love to return again with the same or another group! 1/2/18 Eagle View Retreat We love, love, LOVED starting off our new year in this GORGEOUS cabin! Thank you so much for having us. We won’t forget the memories we made here any time soon. Vincent & friends. 11/19/17 Eagle View Escape Group of 4 couples, had a wonderful weekend together in Hocking Hills! Loved your place! 11/12/17 Eagle View Retreat Girls Weekend! The weather was chilly so it was relaxing to hand out, play games and laugh together. We had a great time! 11/8/17 Eagle View Retreat Love the country feel. The cabin is beautiful and very relaxing. We will definitely be back. The Pauley’s 11/5/17 Eagle View Retreat Thanks for the memories. 11/3/17 Eagle View Escape Had a great gal trip with 3 of my sisters and 2 long time friends. Enjoyed the hot tub and all. 10/22/17 Eagle View Retreat Had a great time, your cabin is beautiful! It was a great 70th birthday retreat!! 10/22/17 Eagle View Escape 10/20/17 Eagle View Lake House Thank you once again for a lovely place to call “home” for a spell. The house and accommodations are most comforting. I long for days and nights here as it helps me return to center. Good for the mind and heart! Howard and I appreciate you!! 10/16/17 Eagle View Escape Stayed with a family of multiple generations. Had a great time. The house was very comfortable. Thank you! 10/3/17 Eagle View Lake House Thank you, always wanted a house on the lake. Your cabin provided the rest & relaxation we needed. Will be back. 9/27/17 Eagle View Escape Another successful girls trip!! Thank you for a great place for us to get together and catch up! 9/22/17 Eagle View Escape I surprised my husband with a weekend away. The stay was wonderful!! We hiked a lot and it was great to come back to this home and relax in the hot tub. Beautiful place. Thanks and we hope to visit again. 9/15/17 Eagle View Retreat Had a great time! Thank You!! 9/13/17 Eagle View Lake House Girls trip! In spite of the rainy weather we had a wonderful time. Cabin is well taken care of and had everything we needed. Shelley was great with suggestions on where to go and where to eat. Looking forward to another stay in the future. Becky, Monique and Bev. 8/20/17 Eagle View Retreat Thank you so very much for allowing us to stay in your beautiful cabin! Loved it and so enjoyed the solitude and serenity. We so needed a vacation and this was a great blessing to stay here! Thanks again Cincy folks! 8/17/17 Eagle View Escape 4 college friends had a wonderful trip. Lots of hiking. Lots of talking. The house is lovely! 8/14/17 Eagle View Escape A group of close friends loved staying here for the weekend. We enjoyed the campfire and watching the meteor shower from the hot tub. The location was great for getting to beautiful hiking locations. 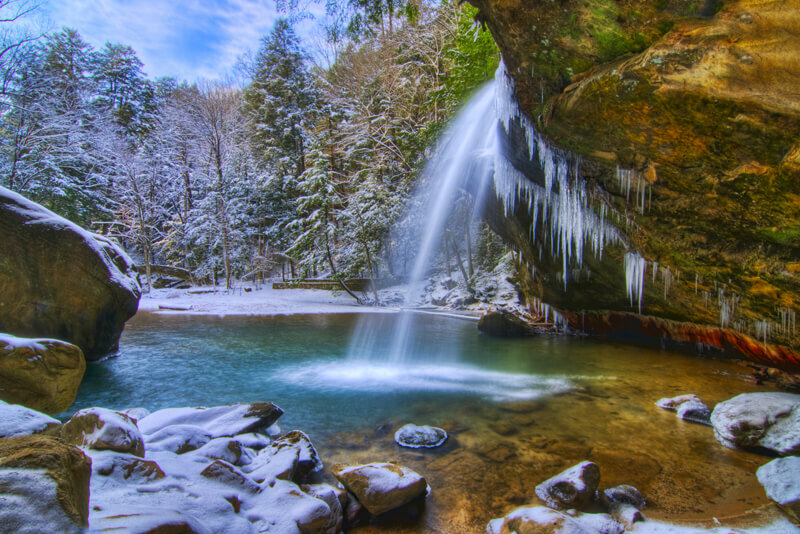 Rockbridge Nature Preserve, Clear Creek, Hocking Hills. Thank you for a great place to stay! 8/10/17 Eagle View Escape Clare, Peggy, Audrey and Cindy had a great time! 8/7/17 Eagle View Escape Had a very nice time. Great cabin and deck. 8/6/17 Eagle View Lake House We enjoyed our mini vacation so much. Your cabin is beautiful. We spend a lot of our time on the wonderful deck. Such a beautiful view of the lake, the swing by the lake is awesome. The hot tub is so relaxing after hiking Old Man’s Cave or Rock House. Thanks again. The Hunkins. 7/27/17 Eagle View Escape We had a great time hiking and boating on Lake Logan. It was nice to come back to such a cozy home and watch all the kids play. We didn’t want to leave. 7/25/17 Eagle View Lake House Thanks for the great stay. Perfect place for a family of four. We appreciate the hospitality and great accommodations that you keep. The Schmachtenberger’s. 7/24/17 Eagle View Escape We came all the way from Cleveland to get away from it all. The home and people were all very warming. Management for the property are helpful and friendly, they really want you to enjoy yourself. I personally wouldn’t stay anywhere else. 7/22/17 Eagle View Escape All 10 of us women enjoyed our stay. The house was cozy and the deck was so peaceful. We enjoyed the area. 7/21/17 Eagle View Lake House Thanks again for sharing your beautiful cabin. See you in 2018!! 7/20/17 Eagle View Escape Thank you for an amazing family vacation. It was our first time here (Hocking Hills) and our family of 7 adults and 3 kids really enjoyed it. 7/16/17 Eagle View Escape This house has such a warm and cozy feel to it. It’s great for a good weekend camping trip with the family. 7/14/17 Eagle View Escape We had a nice relaxing weekend with friends. Loved the house and its homey feel. 7/9/17 Eagle View Escape This place is so beautiful and comfortable. We will definitely recommend this place to friends and family. We look forward to coming back and enjoying your other cabins. 7/4/17 Eagle View Escape Thank you for everything, had a great time. Enjoyed the great location! The house was great for our family. Clean and well kept. Love the décor. We would love to come back. 6/18/17 Eagle View Escape Great little house. Well taken care of. Perfect setting and location. Would definitely recommend to others. 6/10/17 Eagle View Escape Lovely home and property! 5/29/17 Eagle View Retreat Had a great stay! Can’t wait to come back next year. 5/27/17 Eagle View Escape Our first couple’s trip! We had a wonderful stay. Everything was very clean and well kept. The home was beautifully decorated and comfortable. Thank you so much for all of your hospitality! 5/21/17 Eagle View Lake House Mom and Dad of 4 kids decided we needed a weekend away with just us two! This was an awesome way to reconnect with each other! 5/11/17 Eagle View Lake House Fantastic family weekend to celebrate Mother’s Day and my husband’s 49th Birthday. Love sitting by the fire and just enjoying the view. Wonderful cottage and view! Thank you! 4/16/17 Eagle View Retreat The cabin was perfect, made us feel so homey. The view it was amazing. I thank you for trusting us. This weekend was amazing. The cabin had everything we needed. Perfect! Chintan. 4/6/17 Eagle View Lake House Thank you for a great stay! WE had a nice relaxing weekend! We will be back! The Aube’s. 1/15/17 Eagle View Retreat We had an amazing time in your beautifully decorated house! The beds were very comfortable and the kitchen was very well stocked! We enjoyed late nights just eating, drinking and laughing together! Loved the décor and special touches! The Haskin’s, Carter’s, Satterfield’s and Sherwood’s. 11/17/16 Eagle View Retreat Great cabin, so relaxing! Saw deer over on the hills every night and shooting stars. Been coming to Hocking Hills since 1999 and have been to most of the older ones and some of the newer companies but only a few stand out as ones I would come back to. I’ll be back! Sue & Jr.
10/20/16 Eagle View Retreat The Prescotts really enjoyed our stay in this beautiful cabin. I loved the hot tub and the fire pit. 9/14/16 Eagle View Lake House We all were so blessed to find your beautiful cabin.. I can’t begin to tell you what it has meant to us, we love it here and you keep everything so spotless. This weekend was my birthday and it was the best present I received.. to celebrate here. Thank you so much Joyce & Dave. 7/1/16 Eagle View Retreat We sure enjoyed our stay here. Really nice cabin. Thanks for letting us come. Lori Yoder and friends. 6/16/16 Eagle View Lake House Lovely stay and accommodations! Caught 7 nice blue gill right from the bank behind the house. Also caught a 20lb catfish off the dam! Great visit. The Eason’s. 3-4-16 Eagle View Lake House – This place is amazing! Thank you so very much for allowing us to spend some much needed relaxation time in your cabin. The cabin is just beautiful and the views are also! We felt so comfortable and at home during our stay because of the clean cabin and everything you provided. We will be back soon we hope! We had a great time Kristen & Anthony PS We got engaged!!!! October 16, 2015 Eagle View Retreat This cabin is perfect! So quiet & peaceful. Everything I was hoping for after a long day of sightseeing and hiking. The hot tub was amazing. We will Definitely be back soon. My daughter will be able to come in a couple more years and She will love it. Thank you so much Tim & Melissa PS He proposed!!!!! October 16, 2015 Eagle View Lake House Wonderful view of the lake – caught many fish from the bank and watched the Eagle throughout the weekend. Only down side… wife caught more fish than Husband!!! September 11, 2015 Eagle View Retreat We had an amazing stay! Very peaceful and the feel of the cabin was near perfect. Would definitely come back and recommend to others. Hopefully other families have as good of a time as we did this weekend. Thank you for having us. DJ & Missy. August 29, 2015 Eagle View Retreat We had a wonderful time! We loved sitting on the porch swing watching the Hummingbirds especially in the early mornings. This cabin was great! It is not too far from everything, but far enough to “get away.” The hiking was wonderful!! We really enjoyed the Fudge shop in the Hocking Hills Market. We had a great time!! 6/24/15 This place is awesome, very relaxing and peaceful. This is our style of “camping”. The hot tub is amazing as well. The teenage boys loved fishing along the lake. Jan. 19, 2015 We had an absolute wonderful time. Relaxing, clean, comfortable and gorgeous touches. Great way to spend my Birthday. We will highly recommend to friends & family. Thanks Mike & Julie. September 3, 2014 Thanks so much for everything! We rented a pontoon boat for a few hours and had a very relaxing evening. The view from the deck is awesome! The outdoor seating… We fell in love with! Everything was just so comfortable. I will be buying the zero gravity chairs when I get home. The bench is beautiful and the swing was perfect. (We had a wonderful afternoon breeze) It’s so nice to come to a rental & not have to clean before you unpack! We can’t wait to come back. Hoping to chat soon. Lori & Scott, Charleston, W. Va.